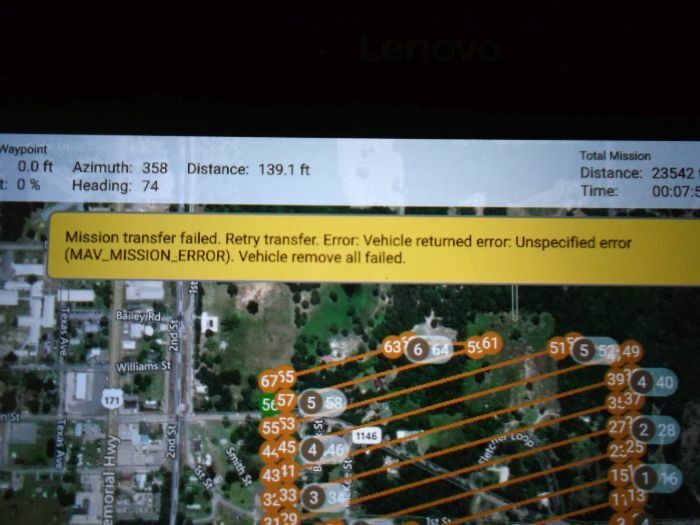 after successfully performing a survey mission using QGC on an android device and a pixhawk equipped vehicle, I am unable to clear the mission by selecting "clear vehicle mission" in Plan File. after clicking "yes" to clearing, a Mission transfer failed warning displays. any others experience this? possible cause or fix? thanks! so far I have been deleting each waypoint one at a time, in order to proceed with planning a new mission. other than experiencing this little problem, QGC is great! oh, and picture is of a survey I created just for displaying the error and not a mission I actually performed!